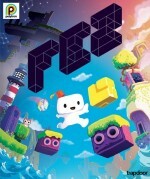 FEZ is a game developed by POLYTRON. In it, you play as Gomez, a 2D creature living in what he believes is a 2D world. FEZ is a videogame developed by Polytron Corporation, available on Xbox Live Arcade, PC Mac Linux via Steam, Humble and GOG, and on PS3, PS4 and PS Vita.